Ideas for the first day to engage creativity in any advanced class. I begin in Art 2. See also this page and this page! Sketchbooks are an amazing opportunity to draw, visualize, write, thumbnail, or fill countless hours doodling and relaxing. Part of the problem with sketchbooks is that artists see them as the enemy. They are white pages that command a perfect image. 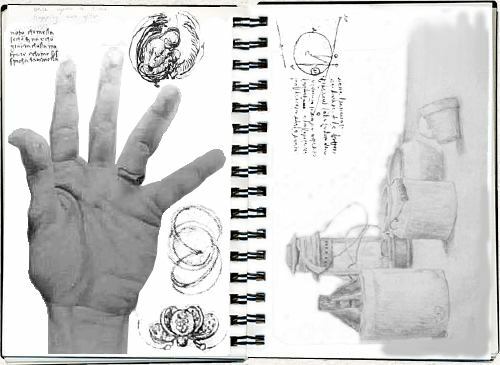 Consider using your sketchbook as an extension of your personality as well as continuing to improve your artistic skills. Remember your sketchbook is a tool to better yourself and not viewed solely as a grade. Directions: Using the list below prepare pages in your sketchbook using your own individual flare. You will be graded on the completed steps, your inventiveness, and craftsmanship. Each page can now be "used" and hopefully the white page syndrome of the sketchbook will fall by the wayside. Remember you are not creating finished works, but creating interesting surfaces to draw onto later. "used" and hopefully the white page syndrome of the sketchbook will fall by the wayside. Remember you are not creating finished works, but creating interesting surfaces to draw onto later. Create a two color wash on the page. Collage text on the page and wash over the page to subdue the texture. Scribble on the page with pencil; blend with a paper towel to create a value. Create a one color wash on the page. Cut squares in the page. Draw a childlike drawing on the page and paint over it. Create a repetitive pattern on the page using a geometric shape. Find a simple object and cover the page with simple contour drawings of it. Using muted colors paint a page. Create a texture on the page with paint by lifting paint with a towel. Create a negative space painting with a wash.
Cover the page with writing about your first day and summer. Collage random pieces on the page. Cut strips of colored paper and glue to the surface. Doodle on the page with a pen. Tear a page out and re-collage onto another page. Find a leaf outside. Represent the leaf in some way on the page. Prep 5 other pages any way that you would like. Remember that the pages should not be overwhelming. Be neat, use good craftsmanship, and beware of pages sticking together. A sketchbook is a journey, not a destination!!! 2. Another good idea is to print out a variety of sketchbook assignments on address labels and give them to the students. I have printed 30 different assignments on one page of sticker labels and printed one (each student receives the same problems) for each student, there is some initial cost for the labels but you will not have to give out another assignment sheet for the rest of the year. I created open ideas that instill good observational, creative, and compositional skills. Give each student the same printed page and they can chose what problem to tackle for their sketchbook for the week and stick the one they selected to the back of the page, or you can have them stick them to the prepared pages and they would be forced to move through the sketchbook in an unordered way. This gives the student options and allows them ownership in what they draw each week depending on their mood... but also keeps them focused on the skills they need to work on during the year. I have them staple the label page to the back of their sketchbook so that they do not lose it. I saw this idea and loved it and decided to adapt it to my art 2 and 3 classes and what kid does not like stickers?....even high school kids have a fascination. Here are some old and new ideas... the earlier ones in the list are more simple than the later ones. How do I love art: Let me count the ways!! Only object I found at this location_____? Collage Design only, No other media. Dots to Drawing: Only a pencil eraser and ink... Stamp your heart out!! Everything in my backpack... Wow me!! DEPICT OBJECTS YOU LOVE. EACH WEEK, CREATE A STRONG COMPOSITION UTILIZING INTERESTING IMAGERY. AT THE END OF THE SIX WEEKS, YOUR SKETCHBOOKS SHOULD REPRESENT AN OVERALL VIEW OF WHO YOU ARE and WHAT YOU LOVE. Create a drawing that uses expressive line. Be bold. Work the piece until it has a free, but finished look. Create a drawing that utilizes strong contour line and color. Create a center of interest. Create a drawing that utilizes strong contrast. Use media of choice. Create a drawing that utilizes repetition to achieve rhythm. Think creatively. Create a drawing that utilizes mixed media. Do not overwhelm the drawing. Be graceful with your media and allow it to direct you to the drawing. COLOR, FOOD, CLOTHS, MUSIC, PATTERNS, CHILDHOOD MEMORIES, FRIENDS, CHAIRS, OUTDOORS, BOOKS, CLASSES, HATS, SHOES, FAMILY, CUPS, CLOSET, ROOM, UTILITARIAN OBJECTS, PRESENTS, SUPPLIES, GLASSES, ARTISTS, THINK, THINK, THINK, THINK, THINK, THINK, THINK, THINK, THINK. DEPICT OBJECTS THAT HAVE REFLECTIVE SURFACES. CREATE A STRONG COMPOSITION UTILIZING INTERESTING IMAGERY. AT THE END OF THE SIX WEEKS, YOUR SKETCHBOOKS SHOULD REPRESENT A VARIETY OF INTERESTING AND CREATIVE SURFACES. Create a drawing that uses expressive line. Be bold. Work piece until it has a free, but finished look. All objects must be from life. BE CREATIVE WITH YOUR SURFACES AND THE REFLECTIONS THAT ARE CREATED. Assignment 3: Do you Dream in Color? DEPICT OBJECTS THAT DEAL WITH COLOR. EACH WEEK CREATE A STRONG COMPOSITION UTILIZING INTERESTING IMAGERY. AT THE END OF THE SIX WEEKS, YOUR SKETCHBOOKS SHOULD REPRESENT AN OVERALL DIVERSITY OF COLOR AND ITS USE IN ARTISTIC COMPOSITION. ALL DESIGNS SHOULD BE NONO-OBJECTIVE, ABSTRACTED FROM LIFE, OR FROM LIFE. DO NOT USE 2D IMAGES. PUSH COLOR, AVOID TRADITIONAL COLOR SCHEMES. DRAW WHAT YOU ENJOY, BUT THINK OUTSIDE OF WHAT TRADITIONAL BEAUTY IS. WORK TO CREATE BEAUTY IN THE UNAPPARENT. An easy way to learn to draw the full figure is by drawing the figure from a back view. Drawing a figure from the back minimizes details, stresses shape and contour, and eliminates the face. To make your composition interesting and exciting, emphasize an element or principle of design. Draw a person’s head and face using exaggeration to communicate emotion. Work from a live model. First use a pencil to make a general drawing. Note the shapes and planes of the face and how they fit together. Then continue over the drawing with a darker media. Utilize strong contrast to greatly exaggerate the areas you want to emphasize. Work from a live model and do not use a front or side view. Create a drawing of a small group of people. Utilize your skills in design to emphasize the negative space between them. Be creative when dealing with line and shape. Draw from life. Create a mixed media collage and then use figure drawing to add line, value, and color. Make sure the media does not overwhelm the drawing. Focus on strong weighted line, value, and contrast to pop the image. Draw from life. Use a brush and coffee to create a simplistic drawing of shadows (Do not work too wet or the paper will wrinkle). Once dry, come back in and emphasize line, shape and value with a dark contrasting media. Push darkness in the back in an exaggerated way to push the figure forward. Be expressive and work from life. Spend a minimum of 1 hour on each drawing. Look at the historical relevance of shoes. Think about their uses during a variety of time periods. Select a time period and create a drawing of shoes that reflects that time period. Examples: Roaring 20’s, Civil War. Draw from life and use the full composition. Look at the differences in gender. How are how their shoes are different. Create a drawing using a man’s and a woman’s shoe. Create an interesting design using repetition. Work from life. Select an artist that appeals to you. Create a shoe that would belong to this artist. Begin drawing from life and then go wild. Use your creativity. Example: Picasso, bright colors, wacky laces or Van Gogh, Subtle colors, pattern in swirls. Create an interesting composition. Create a mixed media collage and then use a shoe from an unusual point of view to add line, value, and color. Make sure the media does not overwhelm the drawing. Focus on strong weighted line, value, and contrast to pop the image. Draw from life. Use a brush and coffee to create a simplistic drawing of a pile of shoes (Do not work too wet or the paper will wrinkle). Once dry, come back in and emphasize line, shape and value with a dark contrasting media. Use darkness in the back in an exaggerated way to push the focal point forward. Be expressive and work from life. Focus on line and design within your compositions. Refer to the principles of design: rhythm, movement, unity, variety, etc, to enhance your images. Create a drawing of the interior of your bathroom. Focus on angles and lines. Use modified contour line and focus on composition. Create a drawing of the interior of your kitchen. Utilize a full range of value 1-10. Be creative with your mark making. Expressive. Create an interior drawing of your bedroom. Include yourself in the image somewhere. Focus on composition. Create a drawing looking down a hallway. Use color to extend the mood. Focus on some small in this space and make it spectacular. Create a drawing of an unusual interior. Read the definition of interior and work from that. Be creative. ALL INTERIORS SHOULD BE DONE FROM LIFE. DO NOT USE PHOTOGRAPHS. Each week you will take a slide and create a small work of art out of it. Each slide should fit a theme that you have selected. Choose a theme that is interesting and could be well illustrated in a small area. How can I use media in an interesting way? Will my theme and style promote unity? How could my slides be deconstructed in an interesting way? Are my designs compelling and strong? Within the slide you will have to create a small work of art that would emphasize the theme, you would work directly on the foam core or on a small piece of paper of your choice. When you have completed 5 slides, you will then mount them onto a piece of black foam core. You should mount them in an interesting and unique way. Draw a person holding an object. Be creative with the object they are holding. Use contour line and make the object the focal point. Use modified contour line. Create a drawing of your favorite object in your room. Place it in your favorite spot inside of your house. Use contour line and focus on composition. Create a drawing of the messiest section of your room. Think about composition and balance. Make sure you have a focal point. Use modified contour line. Select an object from life. Create a contour drawing of the object and put it in an abstract setting. Be creative and focus on composition. Draw a chair. Repeat the drawing to create an interesting composition. Use modified contour line. When you are done use a sharpie marker to create an design using positive and negative space. Spend a minimum of 45 minutes on each assignment.